A mammogram each year is a good way to catch breast cancer early, right? Actually, it depends on who you ask. There’s controversy among medical professionals on the issue of routine mammography — an X-ray study of the breast — to screen for breast cancer. Some doctors recommend screening based on risk. Others recommend screening based on age. On the other hand, not screening often enough can cause problems. Infrequent screening could increase the odds that women who do have breast cancer may need more complex and expensive treatment or not survive. But screening can result in false positives. A false positive is a test that incorrectly indicates cancer. False positives can lead to unnecessary treatment. Some of the current screening recommendations are not backed by good science, according to Daniel B. Kopans, MD, director of breast imaging at Massachusetts General Hospital and professor of radiology at Harvard Medical School. "There is no scientific or biological support for using the age of 50 as a threshold for screening," Dr. Kopans told dailyRx News. "It has been manufactured. None of the parameters of screening changes abruptly at the age of 50 or any other age. There are more than 30,000 women diagnosed with breast cancer each year while in their forties. More than 40 percent of the years of life lost to breast cancer are among women diagnosed in their forties." With all the confusion and controversy around breast cancer screening, it's good to know the facts and points to consider. Almost no medical treatment is completely without harm — and that includes mammography. The doctor and patient must weigh the risks and benefits. For instance, mammograms use radiation. Some women are more susceptible to radiation exposure than others. Annual mammograms can actually cause breast cancer in these women, according to the National Cancer Institute (NCI). The NCI notes that of 1,000 women ages 40 to 80 who undergo annual mammograms, radiation from mammography will cause one case of breast cancer. However, the NCI also notes that for every 10,000 40-year-old women who undergo annual screening, between one and 16 breast cancer deaths will be prevented over 15 years. Annual screening will prevent an estimated five to 49 deaths in 60-year-old women in the same time frame. A false positive diagnosis can cause unnecessary stress and worry for women. Also, false positives can result in additional and unnecessary treatment. The NCI notes that of 10,000 women aged 40 to 50 who undergo annual screening, an average of 6,130 false positives will occur over 10 years. An estimated 700 of those false positives could result in a biopsy in women aged 40. And 940 could result in a biopsy for 50-year-old women. However, Dr. Kopans said, "As with any screening test, there are women who are recalled for additional evaluation. The recall rate for mammography is approximately 10 percent, which is the same a for cervical cancer screening (Pap test). The major 'harm' from these is some anxiety and inconvenience: 1000 women screened, 900 are reassured that nothing is wrong. When biopsies are done for a palpable lump, the percent of 'false positives' is much higher, and the 'harms' are greater since palpable cancers are at a larger size and later stage than those detected by mammography." Mammograms can also result in what is called overdiagnosis. Overdiagnosis occurs when a breast cancer is diagnosed, but the cancer is not clinically important or the tumor is benign (not cancerous). However, doctors can’t tell whether the tumor is benign without performing a biopsy. Dr. Kopans has a very different viewpoint. "There is NO overdiagnosis of invasive breast cancers," he said. "The arguments suggesting this were scientifically flawed." In an April 2015 letter to Breast Cancer Research and Treatment, Dr. Kopans noted that the primary study supporting the concept of overdiagnosis did not include data on mammography, and the authors said that their results were "best guesses," rather than the result of rigorous scientific research. Screening recommendations from professional medical groups and experts vary. The US Preventive Services Task Force (USPSTF) is an independent expert panel. This panel reviews scientific literature and makes recommendations about preventive medicine, including breast screening. The USPSTF says women younger than 50 should be screened only if they and their doctors feel the benefits of screening outweigh the potential harms. A woman with a strong family history of breast cancer, for instance, might need to start screening early. The USPSTF recommends screening every two years from ages 50 to 74. After age 75, the USPSTF says there isn’t enough evidence to make blanket recommendations about routine screening. As of the time of publication, the USPSTF is reviewing its breast screening recommendations. The American College of Radiology (ACR) and the Society of Breast Imaging recommend annual screening starting at age 40. An April 2014 news release from the ACR claimed that if all doctors followed the USPSTF guidelines, around 6,500 more women would die each year from breast cancer in the US. An April study from the American Roentgen Ray Society found that a large majority of general and breast surgeons continue to recommend annual screening starting at age 40. The majority of female surgeons in the group began or planned to begin annual screening at age 40 for themselves. "There are no data to prove that screening only high risk women will save any lives," Dr. Kopans said. "More importantly, high risk women only account for 25 percent of breast cancers diagnosed each year. Seventy-five percent of women diagnosed with breast cancer have no known excess risk. All women should be screened annually. The 2009 USPSTF supporting data ... showed that the most lives are saved by annual screening beginning at the age of 40. Going to a longer time between screens will result in unnecessary, avoidable deaths." The purpose of screening is to catch breast cancers at the earliest possible stage. Mammograms can find breast cancers too small to be felt with a physical exam. Early diagnosis can mean less invasive treatment, such as a lumpectomy instead of a full mastectomy. With a lumpectomy, only the tumor and a small amount of surrounding tissue is removed. A full mastectomy is the removal of the entire breast. Breast cancers that are diagnosed late are much more likely to have spread. These cancers typically need more aggressive treatment, including more surgery, radiation and chemotherapy. Some doctors feel that the risks of not finding or not treating a cancer outweigh the risks of overdiagnosis and unnecessary treatment. Doctors do recommend other techniques, such as breast self-examination. 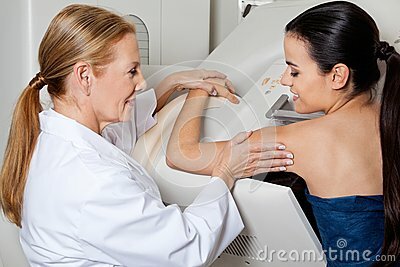 Mammography is still considered the gold standard in diagnosing breast cancer, however. A woman’s best strategy is to talk to her doctor. Together, they can review her known risk factors and the potential benefits and harms of screening to make a personalized decision.